Here’s what to look for that will indicate that you need a new water heater. It should come as no surprise that water heaters are incredibly hardy systems. They have to be since they work every day to deliver fresh hot water to your various faucets, appliances, and showers. However, even though they are usually made very well, the wear and tear will eventually build up and there will come a time when you’ll have to replace it. The sooner you are able to recognize the signs of this, the better off you’ll end up being. Here are some signs you should look for that will tell you that you need a new water heater. Water heaters eventually exhaust themselves out when you put enough demand on it for a long enough period of time. And as water heaters age they tend to wear out more quickly and generate less heat output. If you find that your water heater can’t keep up with your day-to-day hot water needs anymore, it might be time to find a new water heater that can. One of the great things about water heaters is that they don’t really need repairs very often as long as you keep up with their regular maintenance needs. In general, all you’ll need to do is schedule preventive maintenance once a year with a plumber to keep your water heater in good shape. As it ages, though, it will become more likely to develop problems and need repairs. If your water heater needs repairs more than once a year or if the same piece of the system breaks continuously, you should consider having a new one installed. 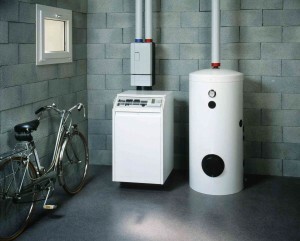 In general, water heaters are designed to last 15-20 years. If it’s older and still working for you, of course, you should continue to use it, but realize that it will probably develop problems such as the ones above, so it might be a good idea to just get a new water heater to save yourself the trouble and repair costs. This entry was posted on Thursday, May 18th, 2017 at 7:06 pm. Both comments and pings are currently closed.